I need to preface this post by saying I am not trying to be sad or depressing, but sometimes events happen that make you really start to think about what is really important. Especially with all of the drama happening everyday in the world around the presidential election or whatever else happens to be floating across the airwaves. When someone you have known practically your entire life passes away and you start to reflect on life. When you have a chance to learn through your moms’ experiences about how things we can think are so important are minute and to be grateful for all that we do have. That moments with family and friends that have become like family, are part of having a full life. That sharing your joys and passions with others is an easy way to show your love for them. This past week I really learned how sometimes the smallest gestures make the biggest impact. That sometimes we get caught up in smallest day to day things because they can be very important; things as simple as a phone call home. I keep trying to figure out what my future is going to be. Will I go back to school? When will I move back to North Carolina, so I’m not 5+ hours from home? Should I try to get into selling desserts at farmer’s markets? Sometimes there are too many questions, and every now and again instead of thinking about next week, next month or next year, I need to start enjoying the small day to day things. Things like these scones, which I was able to bake in my mom’s house when I was home for less than 24 hours, and was able to share with my families. I needed to bake something; to put my love into something, and share it with others. These scones take a little time. They need to be tended to, but not overly worked. 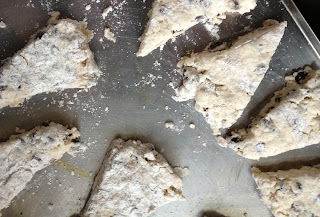 They have a hidden nuttiness from the browned butter, pops of yummy chocolate from the chocolate chips and are flaky and light the way a good scones should be. They are the kind of scone that can easily be enjoyed in the afternoon with tea, but I won’t judge if you in indulge in them for breakfast. They don’t require a lot of ingredients, but are complicated and simple somehow all at the same time. Give them a try and Enjoy! Before heading home there was a quick run with a very unique sunrise. Browned butter and dry ingredients waiting to be combined. Shaggy and almost ready to go. Gently roll out on a floured surface and then cut. Into the oven we go. 1. In a medium sauce pan, melt butter until browned. It will start to smell nutty and then it is ready to go. Pour into a Pyrex measuring cup and place in the freezer until hardened. 2. Heat oven to 350 degrees F. In a large mixing bowl, whisk together the flour, baking powder, salt and sugar. Cut in the butter until the mixture is crumbly (I used my hands with the browned butter to knead the butter into the dry ingredients). Stir in the chocolate chips and then the buttermilk just until incorporated; the dough will be crumbly and look dry. Knead the dough in the bowl a few times to bring the dough together into a single mass. 3. Turn the dough out onto a lightly floured work surface and press into a circle roughly 7 inches in diameter and 1 inch thick. Cut the dough into 8 wedges, and place the wedges on a parchment-lined baking sheet or non-stick cookie sheet. 4. Bake on the center rack until golden brown, about 25-30 minutes. Remove the scones to a rack to cool slightly. Serve warm or at room temperature. Enjoy!